AHLEN, Germany--(BUSINESS WIRE)--Europe's most modern Aloe vera production site was opened on 9 February 2018 in Ahlen. LR Health & Beauty has been developing and producing Aloe vera products for over 15 years. Processing approximately 12,000 tons of Aloe vera leaves, the internationally operating network marketing company is one of the largest manufacturers of Aloe vera products worldwide. 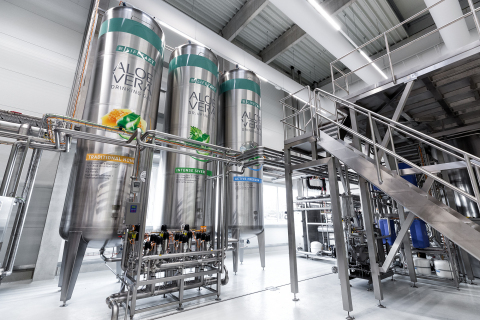 The building at the company's headquarters in Ahlen, where LR Aloe Vera Drinking Gels are going to be produced, was completed in less than a year. The investment in the site amounts to approx. EUR 10 million. “The opening is a milestone in LR history. Aloe Vera Drinking Gels have been among the best-sellers in our portfolio for many years. With the new production site, we are strengthening our claim to products "Made in Germany”. With our innovative high-tech machinery and state-of-the-art technologies, we are also setting new standards in production throughout Europe,” says Dr. Thomas Stoffmehl, CEO of LR Health & Beauty. The company has invested 4.5 million euros in the technical equipment alone. The heart of the production is a 6.50 metre blender that mixes the Aloe Vera Drinking Gels. It is one of ten other machines that were manufactured individually for LR. Per shift, 20,000 litres of Aloe Vera Drinking Gel can be produced. Besides the production plant the total area of 4,000 square metres, also comprises warehousing and shipping facilities. A highlight of the building is a 40-metre-long runway that runs parallel to the production rooms. It is glazed on one side so that visitors can follow the individual production steps live - from blending and bottling to packaging. From this so-called Skywalk, LR sales partners can view the new production site exclusively as part of the visitor programme. There you will also learn everything you need to know about the all-rounder Aloe vera and its processing.